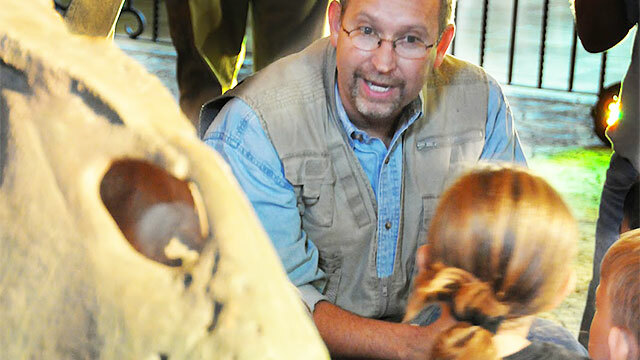 Dinosaur George: Museum in the Classroom gives students the unique opportunity to see exhibits of prehistoric life from around the world, with over 150 museum quality exhibit pieces from the earliest life on earth. From giant Texas reptiles, to dinosaurs and Ice Age mammals, students will see firsthand some of the creatures that once roamed Texas and maybe even in their backyard! Dinosaur George: Museum in the Classroom provides a fun learning environment in Spanish and English! During the exhibit, staff experts will be on hand to answer questions, and Museum in the Classroom is a self-guided tour so that teachers and students can learn at their own pace. Dinosaur George: Museum in the Classroom is one of the largest traveling school exhibits in the country. The learning process doesn’t stop when the exhibit travels to the next school. Dinosaur George: Museum in the Classroom provides curriculum and activity pages for grades K thru 6th grade, incorporating a large number of Science, Math and English lesson plans.